Ewon with the participants of the Kampung Sejahtera action plan workshop. KOTA BELUD: The state government is determined to improve the lives of the people of Kampung Lahanas, a small underdeveloped village located in the Kota Belud constituency. Kampung Lahanas is located some 30 kilometers away from the Kota Belud township, with a population of about 600 villagers. Unfortunately, the village is facing a lot issues, from a lack of proper infrastructure, to transportation, education and so on. To address this issue, Kampung Lahanas has been shortlisted as one of the villages under the Kampung Sejahtera programme – an initiative under the State Rural Development Ministry that seeks to develop underdeveloped villages that are located far from its township or district office. Rural Development Minister Datuk Dr Ewon Benedick said Kampung Lahanas (which is under Kadamaian) was selected by the Kota Belud District Office to undergo the programme as it was one of the villages that is lacking in terms of infrastructure and economy. Prior to this, the same programme was conducted at two other villages in Kota Belud, namely, Kampung Song-Song (under Usukan) and Kampung Mandawang (under Tempasuk). “Since 2014, 50 villages have been selected to undergo the programme – the Rural Development Ministry is expected to identify ten more villages next year,” Ewon told reporters when met at the closing ceremony of the Kampung Sejahtera action plan workshop at Kampung Lahanas on Thursday. The workshop was conducted to outline the main issues of the village whereby the villagers were given the opportunity to voice out their ideas. After listening to the woes of the villagers, Ewon concluded that some of Kampung Lahanas’ problems could be solved promptly while the other problems might take more time. For example, on the issue of education, he reckoned that the matter could be dealt with swiftly as compared to issues such as the construction of proper roads or the pricing of rubber. Upon hearing about the education issues in the village, Ewon, who is also the Kadamaian assemblyman, contributed RM5,000 to the Kampung Lahanas Education Fund, which was presented at the closing ceremony. Sapinding Kalinding, 54, who is one of the villagers, said the poor condition of the road had made it hard for children to travel to school. “Among the most pressing issues that need to be addressed here are our roads … we hope there will be an allocation to cover the road leading from Kg Lahanas Sokid to Kg Lahanas Siba – which is about four kilometers long, with concrete,” Sapinding said. He said upgrading the road would also prevent the Rumalau River, which is the third biggest river in Kota Belud, from getting polluted. He disclosed that the Rumalau River is being used as a water catchment area; thus, the villagers have put in efforts to ensure that the water flowing there will stay clean. Sapinding also said Kg Lahanas had three main tourism potentials, namely the Badi-Badi Tompuan, a natural lake and the Trinity Hill hiking trail. “I am very thankful, especially towards the District Office, which has worked hard in organising this Kampung Sejahtera action plan workshop,” he added. 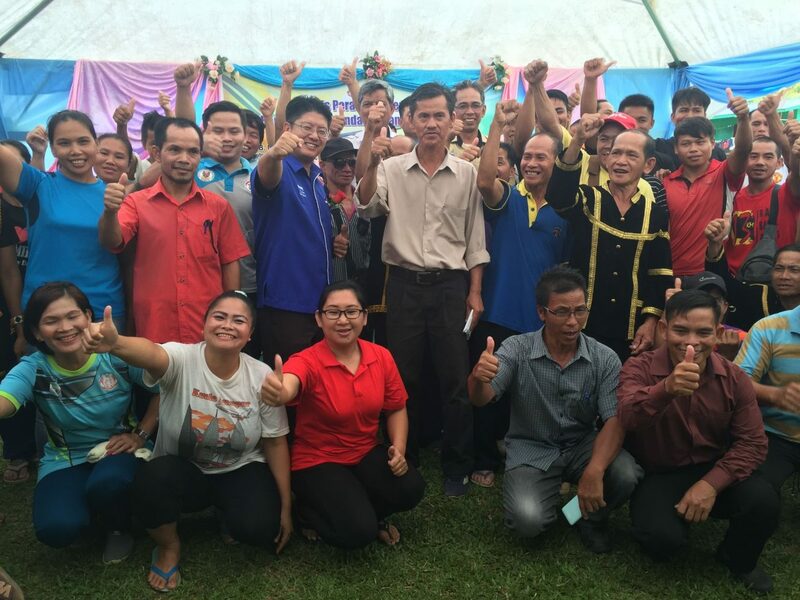 He said the Kampung Sejahtera programme had given the people of Kg Lahanas the opportunity to realise all the development plans for the village. Meanwhile, Kuin Sain, 43, said many of the villagers had yet to receive their grants. “Only about five per cent of the villagers here have received their grants while the other 95 per cent of the villagers have not,” he explained. Among the other districts involved in the Kampung Sejahtera programme were Pitas, Paitan, Kota Marudu, Sipitang, Kemabong, Tenom, Nabawan, Pagalungan, Tongod, Sandakan, Kinabatangan, Tambunan, Ranau, Papar, Kuala Penyu and Tungku. Also present at the event were Assistant Rural Development Minister Dumi Pangiran Masdal, Kota Belud Assistant District Officer (Development) Norsafi Dukah as well as other officers from the Rural Development Ministry.